All transactions are safe and secure with a reliable history in online purchasing behind each of our associates. Buy the I Drink Your Milkshake Parlor Design t-shirt to own There Will Be Blood clothing and merchandise. This bestselling tee features the odd, emphatic quote from There Will Be Blood displayed across the chest. A parlor style design is displayed above and below the catchphrase. The design forms a moustache-like shape, which appears right side up above the phrase and upside down underneath the quote. 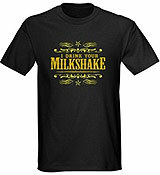 This I Drink Your Milkshake t-shirt is available in a variety of styles and colors, including attractive women's apparel. In addition to the I Drink Your Milkshake Parlor Design tee above, browse the There Will Be Blood Clothing Gallery for more apparel like men's and women's clothes, kids shirts or hoodies.